San Francisco: When I told friends I was testing the Ford Focus for this week's column, most of them gave me a look of pity as if to say, "You poor, poor soul." I still don't understand why some people look down their noses at the little Ford Focus, except because it's so inexpensive that they figure it can't be any fun to drive. After all, how good can a car be when its starting price is only about $13,000, minus incentives? The answer: Pretty dang good. Mainly because of its firm, European-feeling suspension, the Focus is a blast to drive through corners. It's responsive and controllable, letting the driver get a wonderful feel of the road. At the same time, it doesn't have an uncomfortably bumpy ride. The mixture of responsive handling and supple highway comfort is hard to get right, but the Focus gets it just about perfect. It feels like a much more expensive car. While handling is what makes the Focus really stand out from the economy-car crowd, it knows some other neat tricks. For starters, there are three terrific four-cylinder engines available - the basic 110-horsepower version, a 2.0-liter that makes a smooth 130 horsepower, and a brand-spankin'-new 2.3-liter version that's good for 145 horses. The new engine is especially impressive. When I first stepped on the gas, the 145 horses quickly moved from a trot to a stampede. "Holy (insert your favorite expletive)!" I thought. "Economy cars aren't supposed to do that!" Even with an automatic transmission, I soon learned that this Focus could chirp its tires when leaving stoplights if you gave it too much gas. It had muscle-car speed, go-kart handling, a killer stereo, and some nice options for about $19,000. No complaints here. Inside, the Focus is slightly better than average compared with other cars in its price range. Like all economy cars, it suffers from some cheap-looking plastic trim and chintzy fabric on the seats. Ford says the "textured velour fabric" offers an "upscale ambiance," but it honestly looks like a low-rent studio apartment with a new coat of paint. Oh well. That's the price you pay for the price you pay. Despite the fairly cheap look, the interior is remarkably comfortable. The seats are firm and supportive to fit in with the car's sporty personality, and controls all seem to be well placed and logical. There's also plenty of room in the front seats, but the back seat can be a little cramped, exactly as expected in a compact car. 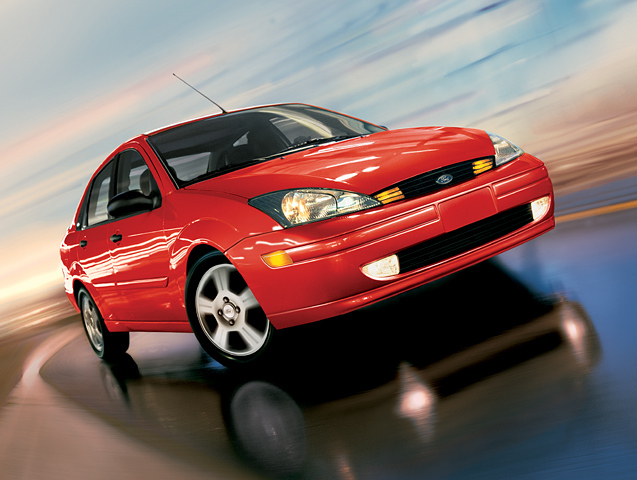 From a styling standpoint, the Focus still looks fresh and innovative even though it was introduced a half-decade ago. It was the first Ford to feature "New Edge" styling with harsh creases and intersecting lines, and it's aged gracefully - something you can't say about too many cars with "revolutionary" styling. On a side note, if you're looking for more performance than even the new 2.3-liter engine can offer, check out the SVT Focus. It makes 170 horsepower and comes with a slick-shifting six-speed manual transmission - very, very fun. The same department that builds the Mustang Cobra and the super-fast Lightning pickup truck makes it, and it starts out at around $18,000. All in all, think of the Focus as the Rodney Dangerfield of compact cars. It's one of the best vehicles in its class, and it deserves much more respect than its cheap price tag would suggest. Ford's "New Edge" styling has aged gracefully on the Focus, which offers a brand-new, 2.3-liter engine that's much more powerful than you'd expect from an economy car. Despite some cheap-looking materials, the affordable Ford Focus has a comfortable interior with roomy front seats. The back seat is a little cramped, but what do you expect - a limo? Not for under $15,000.